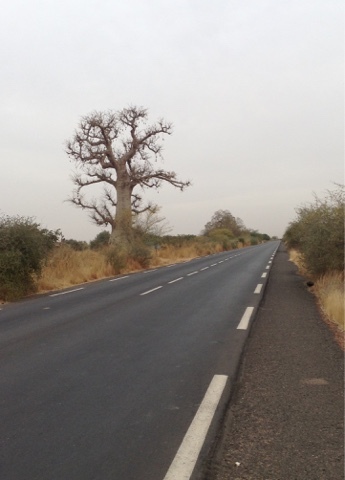 I was so focused on the road and attentive to the traffic on my ride into Dakar from the airport I didn't even notice that there were baobabs here and there along the way, some lone sentinels and others in clusters. It is a wonder that not a one of these towering divinities attracted my attention, either their grand presence or the power emanating from them. If Janina had been along she would have excitedly been pointing them out. She is always amazing me by the items she spots that I miss as we are bicycling along. She has the artist's eye sensitive to her surroundings, while I tend to concentrate on the task at hand. 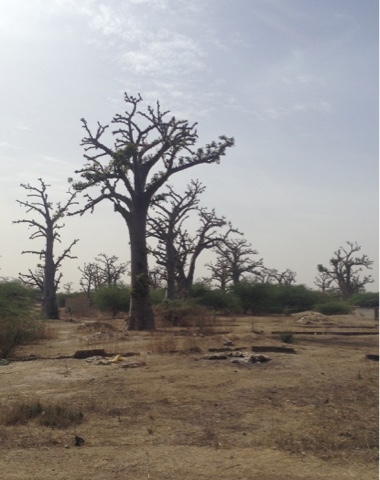 Noticing the baobabs made the long thirty-nine ride out of Dakar on the road I had come in on two days previously a little less painful. Not only was I perplexed by having overlooked the baobobs on the ride in, I was further perplexed that the airport had been situated so far out of the city. There had been plenty of open space half the distance that could have accommodated the complex. There had no doubt been some favoritism to cronies or big payoffs to have put it so far away. With no public transportation, the taxi lobby must have been thrilled by the huge fares they could charge. At least there was a tollway for them to zip into the city. 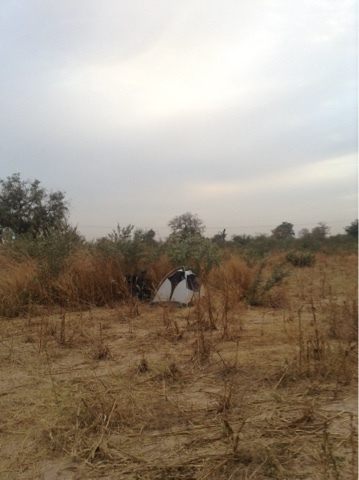 I continued sixteen miles past the airport continuing south just inland from the Atlantic, which was beyond site, before I turned inland out of a headwind for my nine hundred mile trek east to Bamako, the capital of Mali. The traffic only diminished slightly. The road remained two lanes wide, but with a less smooth shoulder that dropped down from the highway, making the riding a little more out than it had been. Long, overloaded trucks forced me off the road every so often when there was oncoming traffic and not room enough to give me some extra space. For the first time ever I was wishing I had a mirror, though at least the trucks generally gave me a friendly warning. 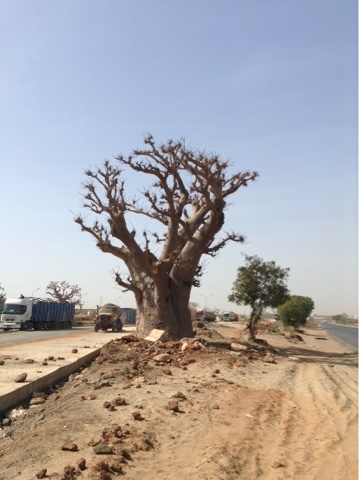 This continued for over fifty miles until the road intersected with the city of Koalack and the road south to Gambia. 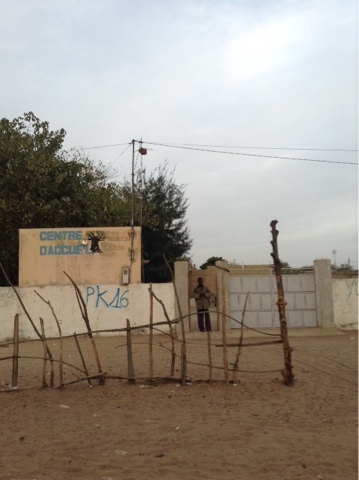 The traffic thinned considerably with the majority of the truckers heading south rather than east to Mali. 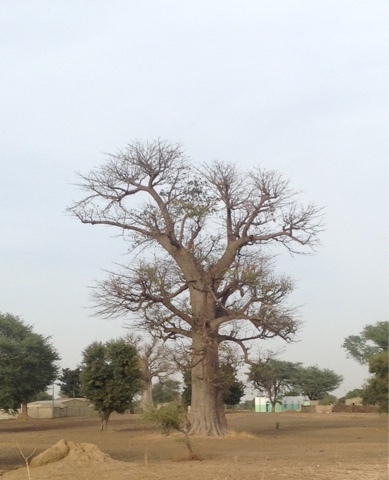 The cycling at last turned peaceable and I could cast more than a quick, furtive eye upon the occasional baobab, mostly solitary figures. They were the lone object to truly enforce my pleasure in being here. I couldn’t help but be thrilled to be off riding my biking in this unlikely, distant land, but it was the baobabs that gave some relief from the tension of these trying circumstances and injected some pleasure into the riding. None is the same with limbs wildly jutting in every direction. It is difficult to pass by any without a momentary pause to genuflect and take a photo.They all have distinct personalities and characteristics. If I were seeking answers, that is the tree I would sit under. One can only wonder how much more profound and perceptive If the Mahatma had sat under a baobab, one can only wonder at the version of Buddhism he would have perceived. Would it have been as gently profound or would it have had more vigor and intensity. What would it have made of the chaos and perplexity of every-day-life. Or would it have depended on the tree—whether he had been in the embrace of a warm and tranquil configuration or of a semi-deranged version. Some are frightening and some are peaceable. I was hoping I could camp under one, but they weren't frequent enough for there to be one when it was time to camp. My first night I opted for an auberge when one turned up in a small dirt road town half an hour before dark when I wasn't confident enough to find a secluded spot down the road. The habitations hadn't been far apart and in the gaps the vegetation was just scattered trees and not many bushes. I was eager to camp, and would have relied on the cover of dark if need be, but was happy with the security of an inn. I stopped at the town's city hall when I noticed the door open to enquire if there was a hotel in the town, hoping that if there wasn't they might invite me pitch my tent in their walled-in compound as happened to me in the Philippines. But surprisingly the town had an inn, though it didn't look like it got much business. It wasn't even identified as an auberge, rather a welcome center. The best part of the place was the baobab tree on its sign. There were two small buildings with four or five rooms in each. Based on the lack of tracks in the sandy dirt leading to them, it didn't look like they had been used in a while. There were no sheets on the bed nor running water in the bathroom, just a five-gallon jug for bathing and flushing the toilet. I’ve had plenty of experience with such accommodations, so didn't flinch. Once in Kenya when I was showed what I was in for the proprietor was surprised I accepted. He said no Kenyan who had been to America would accept such primitive accommodations. When I turned in, I could feel mosquitoes nibbling on my legs, so I got to sleep in my tent after all. I would have set it up outside to begin with in the walled-in compound, but the proprietor had been insistent about no camping when I asked if I could use my tent. It was late enough when the mosquitoes forced me in to my tent, I was tempted to set it up outside, but opted for the concrete floor. It wasn't the best night of sleep, what with the hard floor and the temperature never dropping below 80 in my cell. That wasn’t much cooler than the day-time temps. It has been hot, but not sweltering, largely thanks to a brown haze from the stirred-up dirt and sand that blunts the sun. My legs and arms are just a slight pink from what sun does penetrate. No need for sun block. A cold drink was a rarity. Not many of the small towns have cafes or even small stores offering cold drinks. I've been relying on gas stations. Most advertise a boutique with snacks and drinks. The gas stations also are kid-free. If I stop at a village store and sit and drink little kids gather around me asking for candy. My friend DL, who has been teaching at a university in Liberia the past five years and is on my itinerary, recommended I carry a bag of candy for such situations. I can't bring myself to encourage such behaviour. Whoever started this practice should be banned from traveling and enshrined in the Traveler's Hall of Shame. The candy refrain is relentless. Kids come running as I bike by hoping for a handout. At gas stations I am generally approached by those working at them, who couldn't be nicer. A mechanic said he grew up loving America due to hip-hop and rap. It was his dream to visit America. But he doubted he ever would. I said I had long dreamed of visiting Senegal. Since he was much younger than me, he still had plenty of time. That made him smile. He, like everyone, is astounded I'm biking to Mali. It is beyond their comprehension. No one conceives of the bicycle having such a use. "You could take a bus," they say. I tell them that the bus goes too fast, preventing one from fully appreciating the countryside, especially the baobabs. As my second day on the road drew to a close I had the dilemma of pushing on to just before dark to reach a large city where I could have another night in a hotel or to camp in the slightly more unsettled countryside. A shower and wifi would be nice, but I didn't want another night confined to a sweltering room. When I came to a gas station an hour before dark that had an outdoor faucet that I could duck my head under and wipe off a layer of grime, I took that as a sign from the Gods that I ought to camp. It was the first such faucet I had come upon. Most gas stations didn't even have running water in their toilets, just a bucket of water for the toilet. So that faucet was a true gift. I waited until I reached 80 miles for the day to start looking for a place to camp, though I passed up some possible sites. The closer to dark I am, the better. I still noticed shepherds with goats and others leaving the brush, walking home along the road. One never knows who might still be in the fields up to dark. Just after 80 miles a high row of bushes appeared along the road. I got behind them when there was a lull in the traffic and pushed a little further beyond the road behind some more bushes. There was no baobab in the vicinity, but I was content with this secluded nook. Nice—thanks for sharing George. Enjoy the adventure!